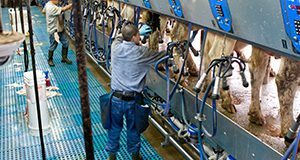 In the Southeast, milk is priced based on fat and skim milk value, with additional bonuses for somatic cell and bacterial counts. In recent years, butterfat has become more valuable. This 7-page document discusses some of the history behind the changes in milk fat consumption, management factors that influence milk fat content and yield by dairy cattle, and economic implications of changing fat content through the diet in two case scenarios. Written by José E. P. Santos and Albert De Vries, and published by the UF/IFAS Department of Animal Sciences, January 2019.